For any form of wildlife to exist in an area, the animals require food, water, some form of protective cover, and adequate space. Most warm-bloodied animals must have a continuous supply of food to provide energy for motion and to maintain body heat. I encountered a number of the large mammals on my recent travel through the American West. While some warm-blooded animals, like bears, hibernate in the winter, other animals migrate from one location to another to obtain food throughout the year. To allow for the long migrations of these animals, individuals and agencies are establishing corridors for the animals to safely travel. One of these corridors involves Yellowstone National Park, Grand Teton National Park, and the lands connecting the parks. These corridors allow elk, bison, pronghorn antelope, mountain goats, and bighorn sheep to pass between areas that otherwise would be wildlife islands. The wildlife food is comprised principally grasses, but also includes browse of twigs and wildflowers. I observed a mule deer consume large amounts of flowering plants, pollinated by solitary native bees. 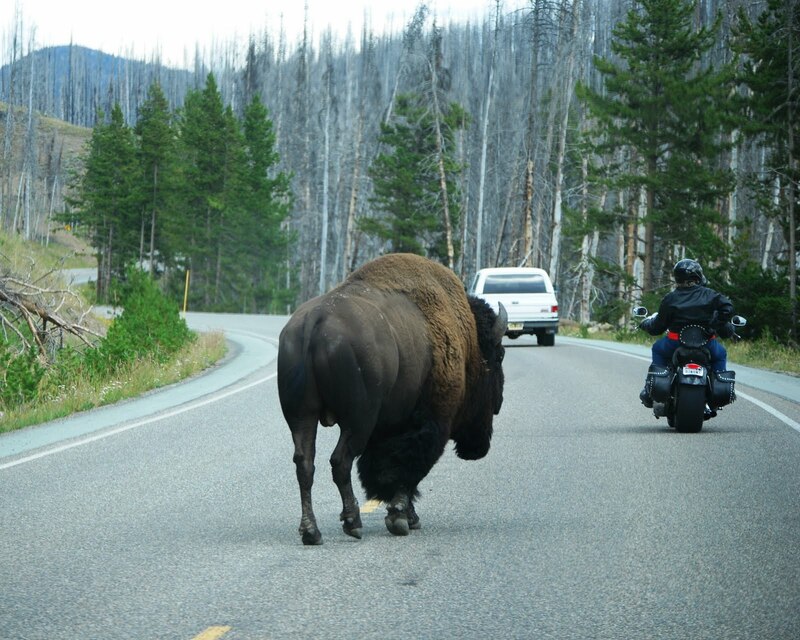 Today’s picture shows a bison dominating a road in Yellowstone National Park. Bison use their massive head and their shoulder muscles to dig into deep snow to find plant material. Its presence is evidence of the results of years of conservation efforts. Cold-blooded animals have an advantage in that they can survive in an area that does not have a continuous supply of food. The animal’s body temperature remains the same as its surroundings. Fish, reptiles, amphibians, and insects are cold-blooded creatures. The honey bee is a unique insect that can generate body heat. It derives energy to produce this heat from eating honey which it gets from flowering plants. 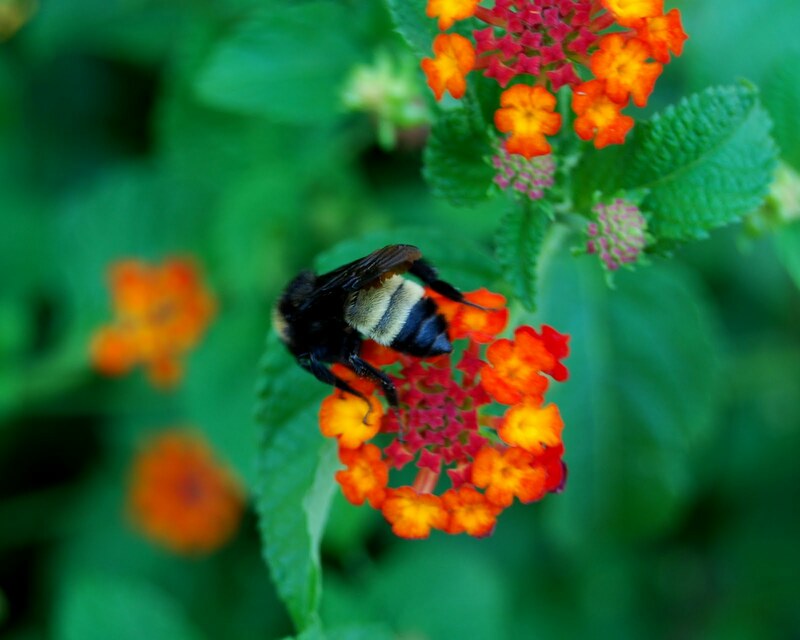 The bees pollinate the plants and assist in their reproduction. 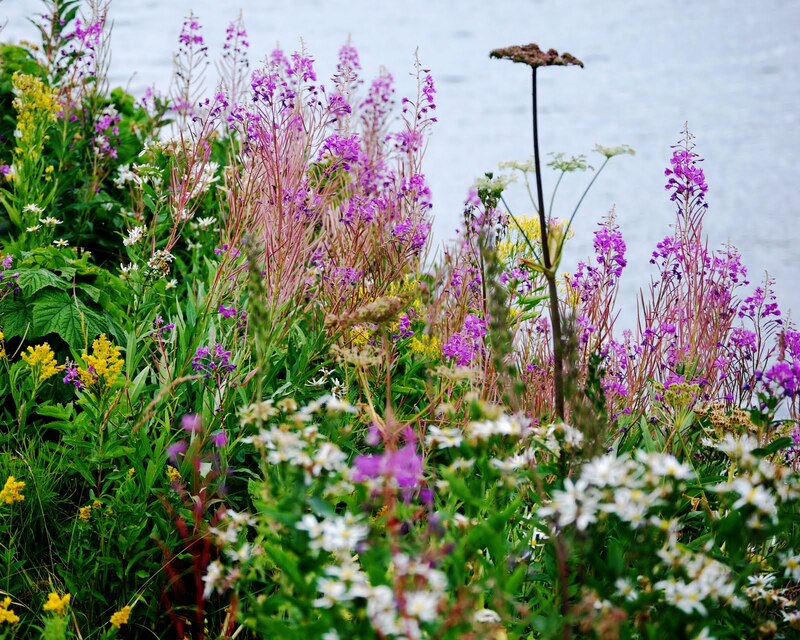 The flowering plants contribute greatly to the food available for wildlife. The wildlife corridors make for greatly enhanced habitat and forage areas for animals, large and small. Animals from bison to bees benefit. While mine was only a brief observation across a narrow path through the American West, it provided an interesting view into the state of our important pollinators. With honey bees and certain other pollinators currently declining in numbers, collecting information about populations is quite important. Fifty thousand people in North America participated in The Great Sunflower Project, http://www.greatsunflower.org/, last year. Twenty percent found no bees at all. Our National Parks are truly national treasures. They preserve the beauty of the land, provide a home for wildlife, and give us an insight into the appearance of the terrain and the challenges faced by those who first settled the areas. As virtually undisturbed natural areas, the national parks also serve as points where we can observe the effect of our modern agriculture and urbanization on our pollinators. Large natural areas, such as Yellowstone National Park, likely contain only native pollinators and feral honey bees; because there are no managed hives in the area. Since honey bees from managed hives would not fly deep into the miles-wide parks, any honey bees found in the park’s interior can be assumed to be feral. In Yellowstone National Park, I found an abundance of wildflowers in bloom. Weather conditions were quite acceptable for bee flight; however, I found no honey bees foraging, only native pollinators. I did observe a number of different species of insect pollinators including leaf-cutting bees, blue orchard bees, and wasps. I would have to conclude that there were few feral honey bee colonies in the area. In the evening, bats were plentiful, and some species of bats are effective pollinators of flowering plants. The national parks give us a feel of the way the land was before Europeans arrived with the honey bee. Wild game existed on grasses and flowering plants that were pollinated largely by native insect pollinators. They rely upon them today. I took today’s photo of Yellowstone wildflowers as I was photographing a mule deer eating fireweed. The variety of flowering plants available to feed the deer resulted from the availability of native pollinators to propagate the wildflowers. This area was cleared of all trees by massive forest fires in 1988, and it hosted an abundance of wildflowers thriving in the exposed sunlight. 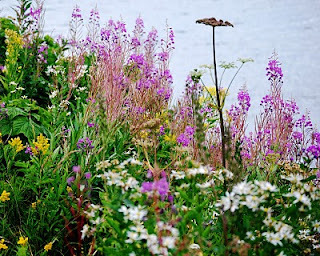 Fireweed, the pink-colored wildflower, is a source of honey and is one of the first plants to sprout after such fires. A drive across the American West gave me quite a view of breath-taking scenery. It also revealed much about the state of our agriculture, wildlife, honey bees, native pollinators, and the success of concerted conservation efforts by many. Travelling to Washington State University, Wes and I passed through eight western states: Arkansas, Oklahoma, Kansas, Colorado, Wyoming, Montana, Idaho, and Washington. My observations revealed an agriculture dominated by large-scale farms and ranches employing mono-cultural plantings of crops and largely supporting the production of beef. Considerable acreage is devoted to pasture grasses, corn, and wheat. Each of these is a grass, a plant propagated by wind and not requiring insect pollinators. Alfalfa, a legume, is a high-quality, high-protein crop grown for livestock food. Alfalfa is often grown in the arid West in irrigated fields. In several locations I observed that pallets of migratory bee hives had been brought in to pollinate the alfalfa. Having sufficient numbers of insect pollinators is especially important where the alfalfa is being grown to produce seed. Wildlife seems to be thriving in the agricultural areas, forests, national parks, and even in the urban areas. I observed a number of mammals along the way: prairie dogs, ground squirrels, white tailed deer, mule deer, elk, pronghorn antelope, mountain goats, bison, and moose. A number of birds were observed: magpies, ravens, and shandhill cranes. Birds of prey I observed included red-tailed hawks, bald eagles, golden eagles, and osprey. Beekeepers always watch for bee hives as they travel. I spotted several bee yards along the way. 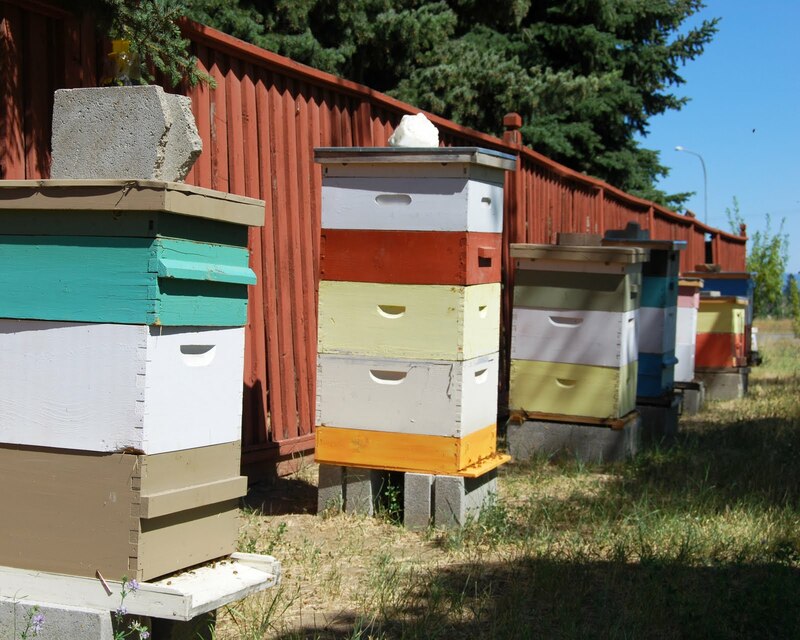 Stationary bee yards were located on small farms with diverse crops and in residential areas. Migratory honey bee hives were located near fields of alfalfa. Wildlife thrives in the natural areas designated as national parks, and conservationists are connecting these to build corridors as migratory routes for animals such as elk, pronghorn antelope, and bison. Bumblebees, like this one pollinating flowers on the Frank Phillips ranch in Oklahoma, have hairy abdomens unlike carpenter bees. Peace Bee Farm will be short one person, at least for a while. Wes Underhill just graduated from Arkansas State University with a master’s degree, and now he will be leaving for Pullman, Washington to continue his education. He will be working toward a doctorate degree at Washington State University. I will be traveling with Wes to Pullman to help him with the move and visit the American West together. Our entire family is quite proud of Wes’ accomplishments, and he will be truly missed. I have checked all of the bee yards, and I know they are in good condition to be left alone in my absence. I know of no queen-less colonies, and all of the hives have an adequate number of boxes to handle brood or honey expansion. The bees will spend the next couple weeks curing summer honey. When I return, I expect to have a considerable amount of surplus honey to harvest. Wes, in the photo with Rita, enjoys selling our honey at farmers markets; and he used the bee farm as a means of helping pay for his college education. He has quite a following of loyal customers and friends among the other farmers. I always enjoy having Wes along when called to capture a swarm of bees. Whenever I go for a swarm, I think back about the time that Wes held the base of an extension ladder while I worked with a bait trap high in a tree. A swarm of honey bees flew into the tree, covering me. I held the bait trap in my hands until all of the bees entered into it in an orderly fashion. In a few minutes, I was able to climb down with the now heavy box holding a large colony of bees. I never saw that coming, literally. I’ll be back at the bee farm in a while with a backlog of short pieces to share. Wes will keep in touch via the internet. It’s a hot summer, and the honey bees are working tirelessly. The bees collect nectar anytime that it is available. The bees brought large amounts of nectar to the hives, and now they are curing the honey. The honey-producing process began with the nectar being mixed with enzymes produced by the honey bees. The enzymes start the process called inversion, the chemical change of the nectar sugars which become honey. In the hive, worker bees continue the chemical change by continuing to mix in enzymes and evaporating the honey. The workers blow bubbles in the honey and stretch it with their mouth parts. They fan their wings across the honey to evaporate water. Once the sugars in the honey have been inverted and the moisture reduced to 18 percent, the honey is said to be cured. The bees cover the cells storing honey with a capping of freshly secreted beeswax. Elsewhere, the transfer of honey bees from the walls of the building to Langstroth bee hives continues with the hive populations growing. A swarm moved into one of the bait hives that I placed in a honey production bee yard. Bee yards seem to have a considerable amount of pheromones present, and they tend to draw swarming colonies of bees. Since swarming honey bees are physically ready to build honeycomb, they can draw out the frames rapidly. The swarm quickly filled two medium-depth hive bodies with comb and then filled it with brood. Farmers markets are social gathering places for the public and farmers. 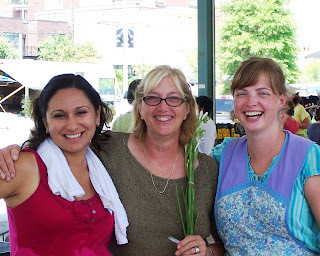 In the photo, three warm friends share a hot summer day at the Memphis Farmers Market. From left to right they are Karen Tims of Tims’ Family Farm of Ripley, Tennessee, Rita Underhill of Peace Bee Farm, and Carolyn Dodson King of Dodson Farms in Forrest City, Arkansas. 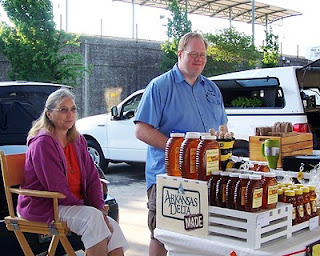 Collectively, they brought to market Tennessee peas, beans, cantaloupes, and famous Ripley tomatoes, Arkansas Delta honey, and Arkansas sweet potatoes, squash, okra, and hand-made jams, jellies, and aprons. This year stands to go on record as the Mid-South’s hottest ever. A hot summer has benefits for the beekeepers, but it also brings difficulties as well. Honey bees often make the most honey in hot, dry years. However, the weather can stress both the bees and the beekeepers as well. The honey bee is well equipped to regulate the temperature in the hive. While brood is being produced throughout the spring, summer, and fall, the interior of the hive is maintained at 95 degrees Fahrenheit. With August daytime temperatures above 100 degrees, the bees cool the hive by moving a number of bees outside the hive. They stand around the entrance, often festooning in a beard of bees hanging from the hive’s entrance landing board. Removing bees helps open the hive for ventilation. Workers fan their wings to produce a flow of air through the hive. The bees also bring in large quantities of water. By fanning their wings over a droplet of water, the workers cool the hive. The beekeeper can help the bees cool the hive by ensuring that the hive is located near a body of water. If a natural source of water is not available, the beekeeper can provide water nearby. As the summertime temperatures climb, the workers stop foraging for nectar and pollen and seek sources of water. Honey bees don’t store water in the hive as they store honey and pollen in honeycomb cells; they store water in the honey gut of the individual worker bees. Beekeepers need to carefully plan their summertime activity. Working around the bees in protective bee suits during hot weather makes the task potentially dangerous. If it is necessary to visit the bee yards, we usually plan on working early in the day before temperatures rise to dangerous levels. 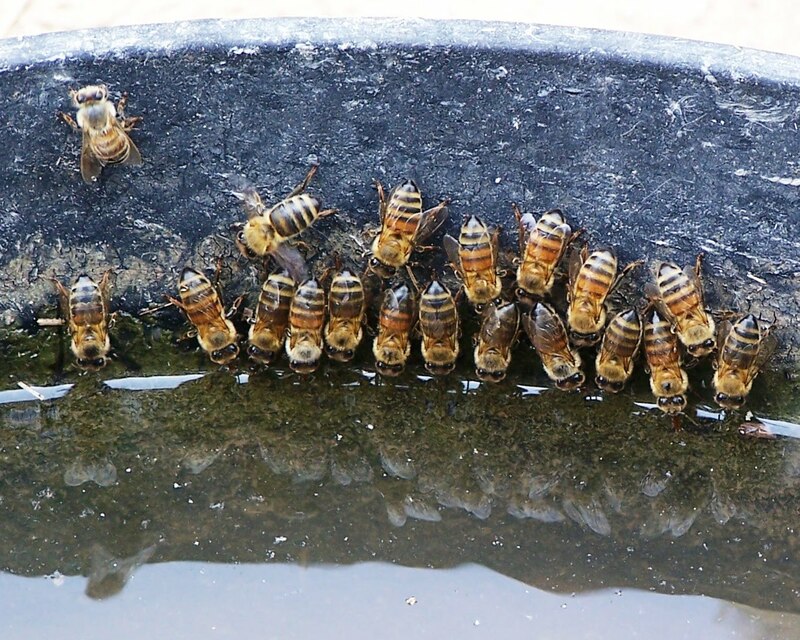 When it’s hot, beekeepers, like the bees, need to stop their normal activity and seek water. In today’s photo, honey bees gather at a poultry watering bowl.